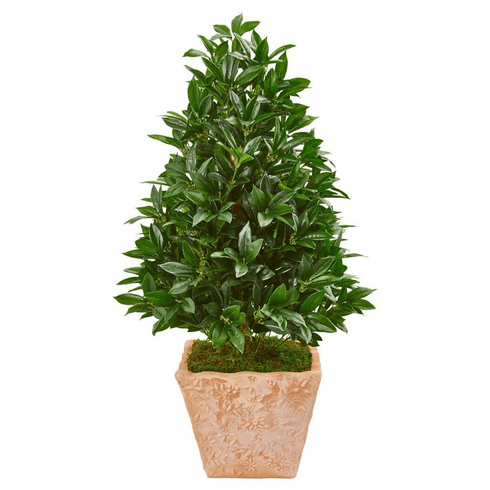 Expertly crafted and arranged rich green leaves make up this UV-resistant 39” bay leaf artificial cone topiary. Looks realistic to the eyes, this ornament will last even without constant pruning and watering. Use it to decorate your kitchen, living room and guest room with gorgeous greenery. Or place it in your sunny backyard and accent it with gnome sculpture for a whimsical finish. Comes in a simplistic terra cotta planter filled with moss. Height: 39 In., Width: 21 In., Depth: 21 In., Color: , Pot Size: H: 10 In. W: 12 In. D: 12 In.